Creating and maintaining an employee handbook can not only help protect your company from legal claims and ensure regulatory compliance, but it can also be beneficial to organisational culture. Human resource departments are responsible for formulating this employee manual which details the company’s mission and values as well as explains HR policies clearly so as to help enhance the company’s smooth operation. An employee handbook is a set of guidelines and regulations given by employers to employees and which contains information about HR policies and procedures so as to help staff understand what is expected of them. Note that although providing such a manual is not required by law, the law does state that employers should provide staff with a written statement of the terms of their contract. As such, many companies use staff handbooks for that purpose. Adding organisational culture information can also help motivate people. As this type of document is legally binding, it’s important to ensure that it is in compliance with employment law, so make sure that it’s reviewed by a legal counsellor each time it is updated or changed. Deciding what to include will depend heavily on the relationship between the employer and employees and the established culture. If you are the HR manager at an organisation which values staff contribution, it’s likely that you will need all the perks and benefits the company offers to the staff. If, on the other hand, there are no perks to speak of and management is promoting a strictly professional work environment, then it will simply detail what is and what is not expected from workers. It’s important to note that a staff handbook should be more than just a long list of dos and donts. Remember that this handbook is generally a first point of contact with new employees and, as such, is a great opportunity to create a positive rapport by including information on culture that will make them happy to have accepted the job offer. This section should include a welcome note and a description of the company’s values and mission. If you work for an organisation that values open communication channels and maintains an open door policy, consider having the CEO draft the welcome note. It’s also a good idea to include a history of the company to help people feel part of the bigger picture. Moreover, stating the company’s mission and values can help everyone get on the same page, while it can also make work more meaningful for everyone. General information refers to everything that the company offers. This will generally be policies that are not legally required but which the company has adopted to help boost organisational culture. So, any perks and benefits like flexible work schedules or even remote working goes in this section. Of course, it’s important that you do not just to refer to the perks and benefits of the job but to also detail the procedure that needs to be followed in each case. So if, for example, you offer flexible work schedules, give information on what that entails (is it for everyone or just full-time workers? Is it limited to a few days each month?). Company policies refer to the rules and regulations that all employees need to follow. These are generally policies that are required by law but they can also be company-introduced policies such as dress codes, extended parental leave, etc. As this section can be vulnerable to legal claims, you should consult with a lawyer or your company’s compliance manager to ensure that the company is in compliance with all legal requirements. The staff handbook can be a great way to build loyalty and commitment with the staff. However, nothing should be as important as protecting the company from legal claims. Whether the company wants to sue employees or they are suing the company, there needs to be no doubt that the policies outlined in the employee handbook can protect the company. Many companies change policies often. Sometimes it’s because these policies are no longer effective and sometimes it’s because the management has decided to change a certain policy. Whatever reasons there may be, it’s important to ensure that there’s a disclaimer in the employee manual that states that policies and guidelines are subject to change. Whenever a new policy is introduced, make sure that you pass it out to staff so that everyone is made aware of new policies. It can be tempting to use legal jargon but there’s really no need for it. Remember that this kind of language introduces barriers and instils a work environment that’s more serious and cold. It’s better to use a friendly note as it helps staff feel more at ease. As employee rights are a sensitive issue, if you recognise a trade union or if you have employee representatives, you need to consult with them before you start drafting the employee handbook or before you make any major changes or updates. Employer branding is a key player in talent acquisition and retention and, as such, needs to be reflected through all organisation policies and guidelines. It can be tempting to simply issue a manual with everything an employee is expected to do and not do, but if you are trying to brand the organisation as an ‘all opinions matter’ company, then the manual needs to reflect that attitude. Many companies see the handbook as an open communication channel between management and staff, and make the most of it by imploring unique methods. Some of the best employee handbook examples feature manuals that are inspiring and interesting while also promoting company spirit. Valve: Valve’s handbook starts with this phrase ‘A fearless adventure in knowing what to do when no one’s there telling you what to do’, which sets the tone for the rest of the manual. Contents include chapters formatted as employee questions, which makes the manual interesting and easy to navigate. Netflix: When Netflix decided to share its employee handbook/slideshow with the world, it went viral. Mainly because it turned the company into a place where everyone wanted to work – and with an emphasis on company values like freedom and flexibility, who wouldn’t? 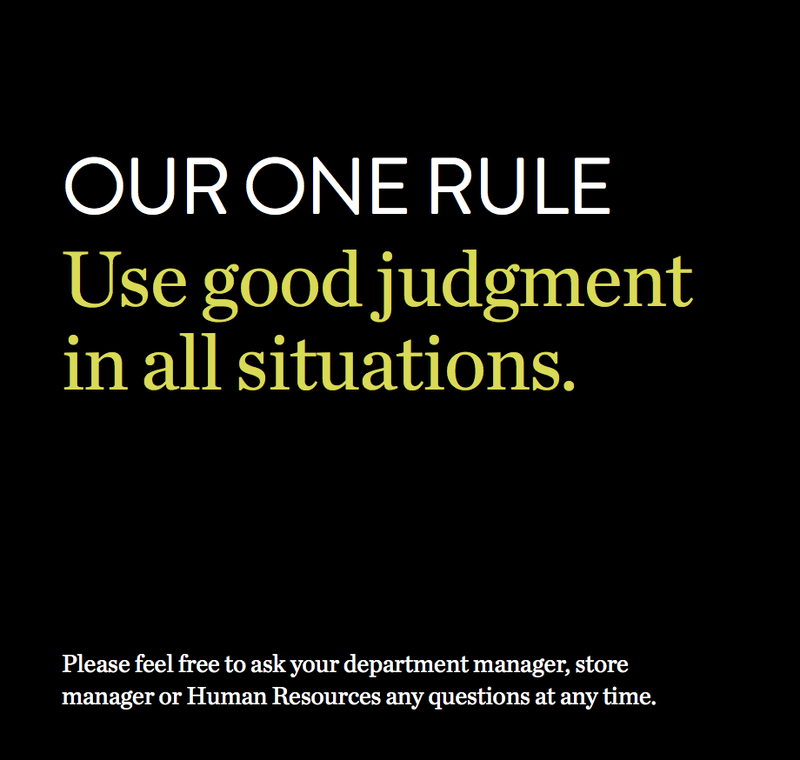 Nordstrom: There’s been an on-going debate for years whether Nordstrom’s infamous one-page staff handbook is real or not. But whether complete or not, it’s obvious that Nordstorm’s revolutionary approach to customer satisfaction translates to their staff approach as well. If you’ve never created an employee manual before or if you simply need a little help with drafting various sections of the manual, you might want to take a look at the templates below. Bear in mind that there should be no copying and pasting in creating a staff manual as this might make the organisation vulnerable to legal accusations. However, you can use the templates below as guides. An employee handbook should always be the articulation of an organisation’s company values. Ensuring that it promotes positive organisational culture and it protects the company from legal claims can go a long way in helping the organisation establish its presence. What would you say is the most difficult part in producing an employee handbook? Let me know in the comments section below!